Inquiry-guided learning (IGL) refers to an array of classroom practices that promote student learning through guided and, increasingly independent investigation of complex questions and problems. Rather than teaching the results of others’ investigations, which students learn passively, instructors assist students in mastering and learning through the process of active investigation itself. IGL develops critical thinking, independent inquiry, students’ responsibility for their own learning and intellectual growth and maturity. The 1999 Boyer Commission Report emphasized the importance of establishing "a firm grounding in inquiry-based learning and communication of information and ideas". While this approach capitalizes on one of the key strengths of research universities, the expertise of its faculty in research, it is one that can be fruitfully adopted throughout higher education. North Carolina State University is at the forefront of the development and implementation of IGL both at the course level and as part of a successful faculty-led process of reform of undergraduate education in a complex research institution. 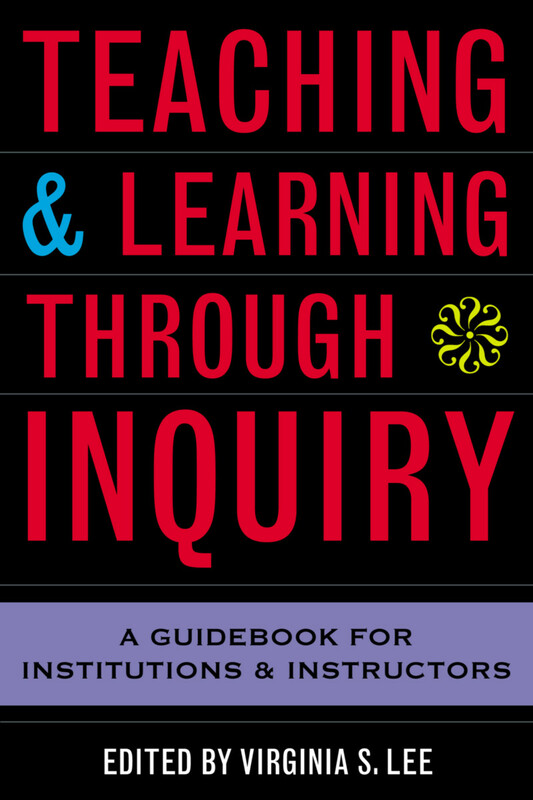 This book documents and explores NCSU’s IGL initiative from a variety of perspectives: how faculty arrived at their current understanding of inquiry-guided learning and how they have interpreted it at various levels -- the individual course, the major, the college, the university-wide program, and the undergraduate curriculum as a whole. The contributors show how IGL has been dovetailed with other complementary efforts and programs, and how they have assessed its impact. The book is divided into four parts, the first briefly summarizing the history of the initiative. Part Two, the largest section, describes how various instructors, departments, and colleges in a range of disciplines have interpreted inquiry-guided learning. It provides examples from disciplines as varied as ecology, engineering, foreign language learning, history, music, microbiology, physics and psychology. It also outlines the potential for even broader dissemination of inquiry-guided learning in the undergraduate curriculum as a whole. Part Three describes two inquiry-guided learning programs for first year students and the interesting ways in which NCSU’s university-wide writing and speaking program and growing service learning program support inquiry-guided learning. Part Four documents how the institution has supported instructors (and how they have supported themselves) as well as the methods used to assess the impact of inquiry-guided learning on students, faculty, and the institution as a whole. The book has been written with three audiences in mind: instructors who want to use inquiry-guided learning in their classrooms, faculty developers considering supporting comparable efforts on their campuses, and administrators interested in managing similar undergraduate reform efforts. It will also appeal to instructors of courses in the administration of higher education who are looking for relevant case studies of reform. While this is a model successfully implemented at a research university, it is one that is relevant for all institutions of higher education. "Faculty, do you want to use inquiry-guided learning in your classes? Faculty Developers, do you want to support change in teaching and learning practices? Administrators, do you want a case study on managing undergraduate reform efforts? If you answer 'yes' to any of these questions, then Virginia Lee's book is an excellent starting point…This book is a 'must read' for faculty, who want their students to learn to think critically, develop inquiry skills, and take responsibility for learning. It offers a key strategy for achieving these goals and deepening the undergraduate learning experience. The book also provides faculty developers and administrators with ideas on creating and supporting change in the higher education classroom." Preface; PART ONE: SETTING THE CONTEXT: What is Inquiry-guided Learning?—Virginia S. Lee, David Greene, Janice Odom, Ephraim Schechter, and Richard W. Slatta; Inquiry-Guided Learning at North Carolina State University: A Brief History—David B. Greene, Virginia S. Lee, and J. Douglas Wellman; PART TWO: INTERPRETING AND IMPLEMENTING INQUIRY-GUIDED LEARNING; All in the Balance: Psychology 201 "Controversial Issues in Psychology"—Samuel B. Pond, III; Music 200, "Understanding Music": An Inquiry-guided Approach to Music Appreciation; Jonathan Kramer and Alison Arnold; SCALE-UP: Bringing Inquiry-guided Learning to Large Enrollment Courses—Maria Oliver-Hoyo and Robert Beichner; Inquiry-guided Learning and the Foreign Language Classroom—Ana Kennedy and Susan Navey-Davis; Incorporating Active Learning, Critical Thinking and Problem-Based Learning in an Advanced French Culture and Civilization Course—Arlene Malinowski; Enhancing Inquiry-guided Learning with Technology in History Courses—Richard W. Slatta; Inquiry-guided Learning in a Food Science Capstone Course—Lynn G. Turner and Christopher R. Daubert; Inquiry-guided Learning Through Collaborative Research in a Graduate Course—George R. Hess and C. Ashton Drew; Inquiry-guided Learning and the Undergraduate Major in the Department of Microbiology—Michael Hyman and Gerry Luginbuhl; The Challenge of Implementing an Inquiry-guided Approach in a Highly Technical Curriculum—Adrianna G. Kirkman, Medwick V. Byrd, Hasan Jameel, and John A. Heitmann; Engineering Computing as an Essential Component of Inquiry-guided; Learning—Roger P. Rohrbach, Joni E. Spurlin, Kathy Mayberry and Sarah A. Rajala; Inquiry by Design: Learning in the Studio Setting—Meredith Davis and Paul Tesar; Inquiry-guided Learning and the Undergraduate Curriculum: General Education and the Major—Susan Blanchard, Marilee Bresciani, Michael Carter, Virginia Lee, and Gerry Luginbuhl; PART THREE: INQUIRY-GUIDED LEARNING PROGRAMS AND RELATED INITIATIVES: Inquiry, Critical Thinking And First Year Programs—David Greene, Janice Odom, and Arlene Malinowski; The Heart of the Matter: Writing, Speaking, and Inquiry-guided Learning—Chris M. Anson and Deanna P. Dannels; Service-Learning: Integrating Inquiry and Engagement—Sarah L. Ash and Patti H. Clayton; PART FOUR: SUPPORTING AND ASSESSING INQUIRY-GUIDED LEARNING: Mastering Inquiry-guided Learning One Step at a Time:Faculty Development and Dissemination—Virginia S. Lee; Assessing the Impact of Inquiry-guided Learning at NC State—Virginia S. Lee; Contributors. Index. Virginia S. Lee has her own consulting business, Virginia S. Lee & Associates, with a focus on teaching, learning and assessment in higher education. From 2000-2004 she was the Associate Director, Faculty Center for Teaching and Learning, NC State University where she led the inquiry-guided learning initiative and had lead responsibility for the design and implementation of faculty development programs. She serves on the editorial review boards of Innovative Higher Educaton and the Journal of Faculty Development and was a past editor of the POD Network in Higher Education's Essays in Teaching Excellence series. She has published and presented on a wide variety of topics in teaching and learning in higher education.